This Honey Bucket Has Most Everything You Need For Survival For The First 72 Hrs. These disaster preparedness kits are packaged in a 5 gallon container designed for the home or office. 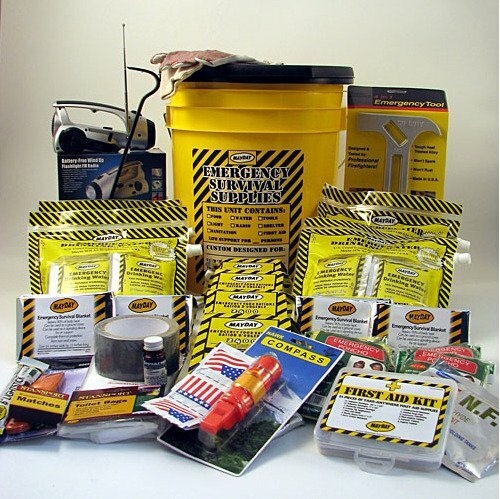 The Deluxe Honey Bucket Kit includes all the emergency food, water, shelter, sanitation, first aid, lighting, and communication supplies necessary for surviving after a major disaster. Whether it’s an earthquake, fire, hurricane, tornado, flood or man-made disaster – make sure you and your family are prepared. All of the food and water products have a 5-year shelf life. Additionally, all of the food products are safe for vegetarians and anyone allergic to nut oils. 1 – 12 Pack of Liners, 6 – Wet Naps, 1 – 12 Hour Light Stick, 1 – T-5 Chemical Toilet Disinfectant, 1 – Roll 10 yards Duct Tape, 1 – Gas & Water Shut Off Tool, 1 – 15″ Pry Bar , 1 – 54 Piece First Aid Kit, 1 – 1 Dynamo Flashlight/Radio, 1 – Pair Leather Palm Gloves, 1 – Utility Knife, 1 – 5 N 1 Whistle, 50 – Water Purification Tablets.